Located at the intersection of the two chapels, this altar embodies the changes that took place as a result of the Second Vatican Council. And so, our community moved out of the cloister to better face the challenges of modernity and to support our calling of education. The shrine did not exist up until that point. The priest would celebrate Mass for the public on the other side of the cloister grill separating the interior and exterior chapels. This area was reserved exclusively for the Ursulines. 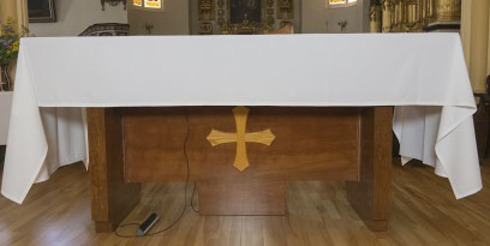 After the grill was removed, Masses were no longer sung in the exterior chapel. Our community now welcomes the public into the chapel, where we attend daily Mass together.